Google professes to wage war on spam, yet payday loans and cloaking techniques can still be found infecting SERPs. The following example really ought not to show in search results, for the most basic of SEO reasons… obscene keyword repetition and very thin content. 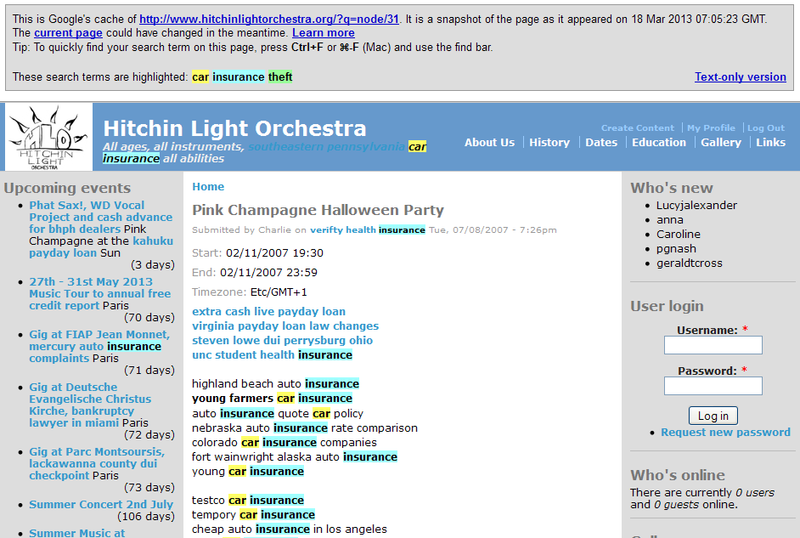 The search ‘car insurance theft’ (at the time of writing) shows a curious entry in position 3, from the Hitchin Light Orchestra. I’m confident that they’d be surprised to know that they are being returned as a relevant result for search on car insurance theft… yet there they are in third place. Surely this is easily detectable – it is utter spam. Thought: Perhaps the new continuously rolling Panda update misses this type of content ? 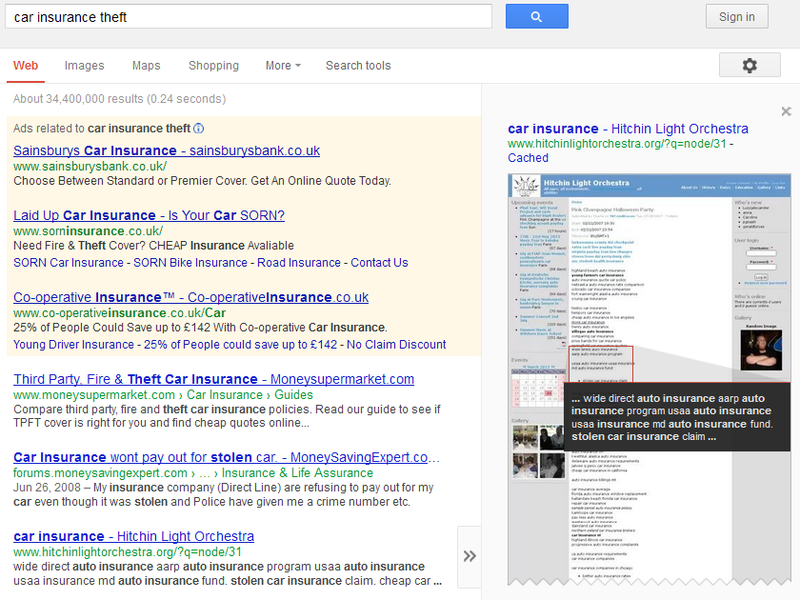 On selecting the link from Google SERPs, you are not taken to this cached page (did you expect anything else? ), but taken through a series of redirections and meta refresh steps to a page full of adsense. The tracking source is declared as Unanimis. The IP address 66.246.72.184 has been associated with brute force SSH attacks since 2005. Each one of those steps should have been sufficient signal to prevent the site appearing in SERPs, yet still it shows, despite Google’s Panda and Penguin updates. 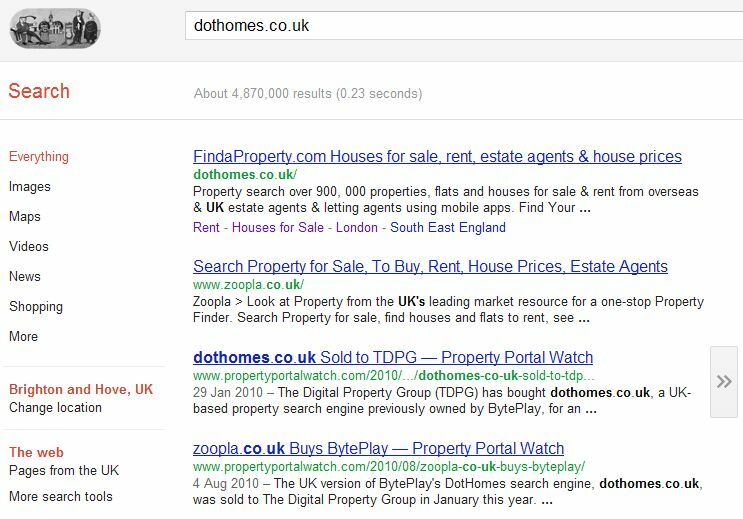 Have You Noticed An Increase in Low Quality Results Showing in the SERPS? Over the last few months, phantom 301 URLs have been showing up in Google search results. What is a phantom 301 URL? 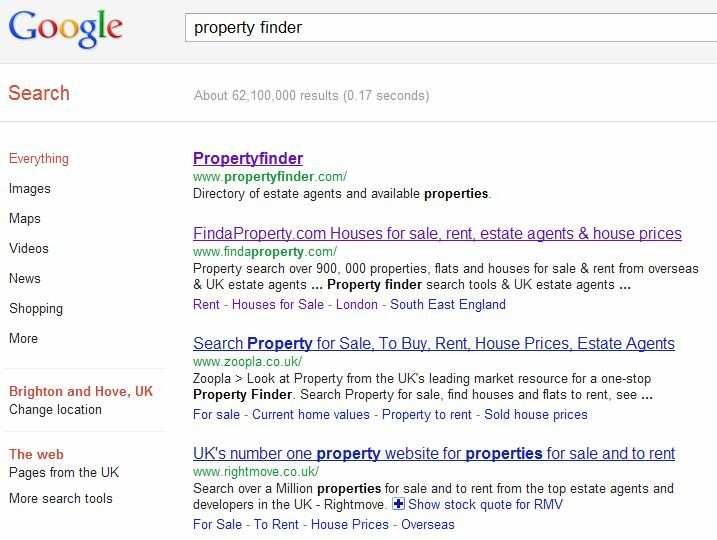 PropertyFinder was bought by Zoopla and 301 redirected correctly with a link map that matched appropriate pages to each other across domains. What is the impact of a phantom 301? Websites that have been bought out, or taken over and had their pages correctly 301 redirected to new sites several years ago are most affected by this change. Before you say, ‘I know how 301s work, and what you are saying simply isn’t true’, read on! What used to happen, is that Google would crawl the old URL, receive the 301 header response and new location, then pass ‘some’ link equity to the new URL, index it and de-index the old URL over a period of a few days. What’s changed ? Is this Panda related ? What has started to happen, is these old URLs have popped back into SERPs. There have been no technical changes, these old URLs are still 301’d (no changes made for many months / years in some cases), but the they are being presented in SERPs carrying the old site name and titles, showing the old URLs and often having much lower quality CTAs. It is as if 301 redirects are no longer guaranteed to remove a URL from the index. 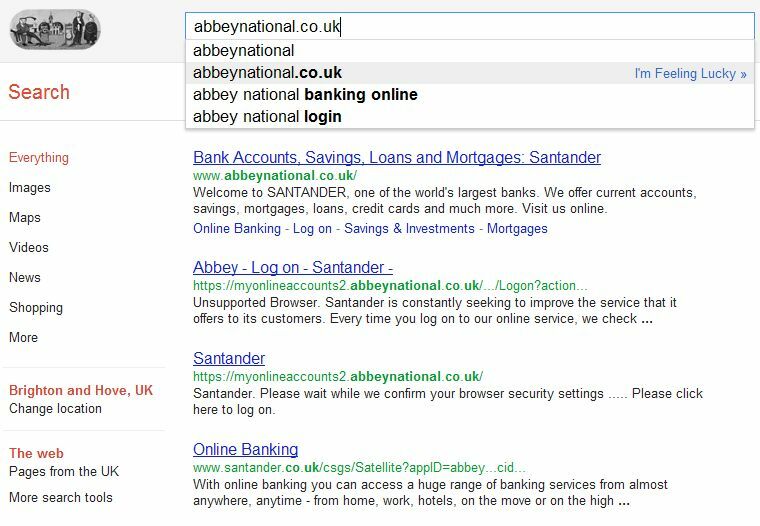 If Google believes the old URL is the best result for the search, then it will show it. My personal hunch, is that Panda is strongly related to CTR testing and bounce rates. Sites that have suffered under Panda have tended to have the sort of content you’d ignore (packed with adverts, poor layout and spelling etc), or the URL in the search results that you’d usually skip over, because the last time you clicked that site, it was full of articles based entirely on spun content. Panda nailed those sites, they were the sites people didn’t like to click on, or stay on. The phantom 301 URLs could be the latest extension of presenting and testing the URLs that people prefer to click. They are back in the popularity contest, despite the permanent redirect. An old URL may have had the best CTR. 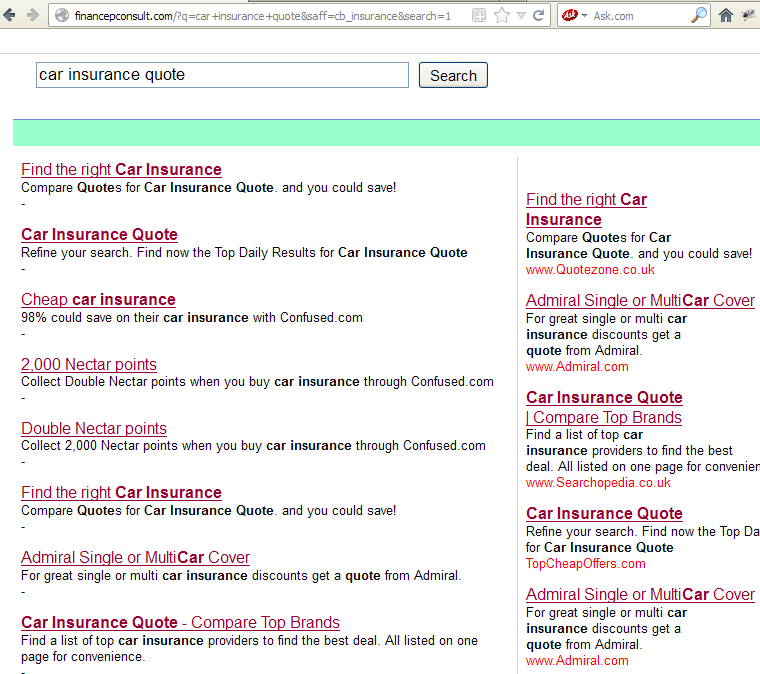 The only way to find out, is to re-present the old URL in the search results and see how it fares. If it receives a lot of clicks, then the phantom menace may be there to stay, whether it is 301d or not. Create a lot of duplicate pages with poor titles and CTAs, then 301 them to competitor URLs in the hope that some of the ‘fresh’ pages create phantoms and devalue the competitors original URL. Occupy more search positions by creating multiple URLs within a site (such as changing to friendly URLs), to allow ranking of the old unfriendly URL that has been 301d alongside the new friendly URL. Continue to add new URLs and 301 to old URLs to create a 301 farm. Google may show some of the new URLs alongside their duplicates for CTR testing. If you have any experience of this phantom 301 phenomenon and how it could be used to advantage, please get in touch.